Thousands of people are expected to descend upon Northampton’s Racecourse this weekend for the annual Umbrella Fair Festival. The two day event will feature a range of music, poetry and dance across more than a dozen stages. This year, there will be performances on an acoustic stage, an alternative rock stage, a cabaret stage and a dub tent. The Global Mela stage will feature world music with jazz and classical music on its own stage. There will also be a lesbian, gay, bisexual transgender cabaret stage, a spoken word stage, theatre stage, open mic stage you stage and the Umbrella Stage. 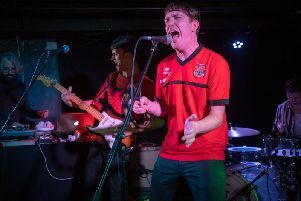 On Saturday, acts playing the Umbrella Stage include Eastfield, Tarantism, Folk The System, Red Triangle Gang, Groovy Underwear, Supersonics, Kismet Hardy and Speak Brother. The following day, Kayanites, VHS Pirates, Hanna Faulkner, Matthew Somerset, Jordan Herbert and Jeet Chahil will play. Performance coordinator Mel Rogers said: “There’s something for everybody at the Umbrella Fair and we’re all looking forward to this year’s event. I think one things which makes it a success is that it’s organised by the people of Northampton for the people of Northampton. There will also be a produce competition on the Saturday. The annual festival is organised by the Umbrella Fair Organisation, a Northampton based co-operative promoting sustainable living, environmental awareness and community cooperation. Its aim is to bring together people from across Northamptonshire to celebrate diversity and promote environmental lifestyles. The Umbrella Fair festival is on August 15 and 16. Music is from midday on both days and runs until 11pm on the Saturday and 7pm on the Sunday. Admission is free.